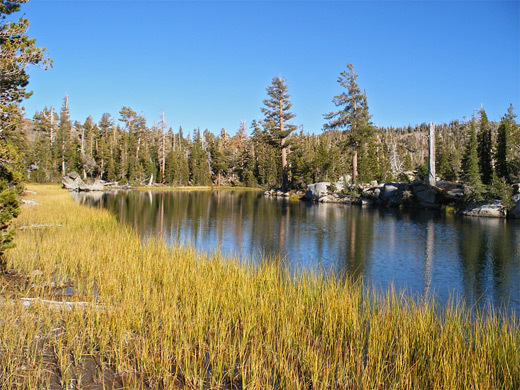 For spectacular mountain scenery in the Tahoe basin, the best and most easily accessed location is the Desolation Wilderness, on the southwest side of the lake, just a few miles from South Lake Tahoe along Highway 89. Far from being barren and desolate, the region has many square miles of sparking granite scenery including over 100 glacial lakes and peaks up to 9,983 feet. 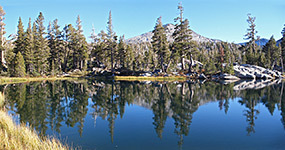 Of the four main trailheads at Meeks May, Bayview Campground, Fallen Leaf Lake and Eagle Falls (see map), the latter is the most used since it provides the quickest route into the backcountry. The path soon passes a small waterfall, climbs a little to Eagle Lake, then after gaining another 1,200 feet reaches a high granite plateau containing several more pristine lakes. Various other paths branch off, and a worthwhile hike could range from one hour (to Eagle Lake) to a backpacking trip of several days. Eagle Falls Trail topographic map, Southwest Lake Tahoe area map. 12 views along the Eagle Falls Trail. 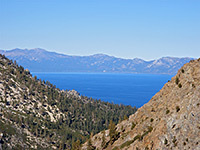 The Eagle Falls Trail begins 8.5 miles from the center of South Lake Tahoe, almost opposite the entrance to Emerald Bay State Park, which features access to the shoreline, a replica Viking castle, and a nice view of Fannette Island in the middle of the bay - a sight mostly hidden from the main road by the surrounding trees. Parking for the hike is either right by the trailhead (fee $5), reached by a very short side road off CA 89, or in a layby along the main highway (no charge), though all spaces fill up quickly on busy days. A small cascade along Eagle Creek is the first destination along the trail, indeed most visitors go no further. The distance to this point is only about 0.2 miles, along a wide, well marked path that climbs via many stone stairs leading to a footbridge over the creek just above the falls, and a junction with an alternative route back to the trailhead that descends the hillside further away from the stream. Past the bridge, the proper hike begins, as the path enters the Desolation Wilderness, in which all travel, even day trips, requires a (free) permit, obtained from a registration board at the trailhead. The route starts to climb steeply through a patch of woodland, up the south side of the ravine, and after 0.7 miles arrives at the junction with a spur to Eagle Lake, situated in a sheltered basin surrounded on two sides by steep granite cliffs. This is a good target for a short day hike, as the next lake (Upper Velma) is well over an hour's walk away. The trail continues up an open, exposed hillside for a while before entering shady woodland, switchbacking up to a granite rockface then a ridgetop that offers the best views so far back down the valley towards Lake Tahoe. For the next half mile, the path climbs some more as it curves around a deep ravine to a junction with the Bayview Trail from Cascade Lake, where the land becomes flatter, and after another half mile the trail arrives at a second junction, at the edge of a wide basin bordered by Dicks Peak in the south and Phipps Peak to the north. The left branch leads to Dicks Lake and eventually Fallen Leaf Lake, while the right branch is to the Upper and Middle Velma Lakes; this path crosses undulating, sparsely wooded land, mostly granite slickrock, with no glimpse of the lakes until close by. 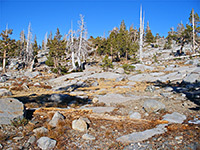 The path seems more bendy than necessary, and the surface is quite uneven (stones and roots) so it takes longer than expected to walk the next mile, though the effort is rewarded by the beautiful blue waters of Upper Velma Lake, lined by a mixture of whitish-grey granite and long yellow grass. This is actually the smaller of two parts of the lake - the main section is 0.4 miles further, reached by turning left at the next junction; straight on passes the west shore of Middle Velma Lake, also in 0.4 miles.